Get a VIP look into the action and craftsmanship behind some of Portland’s best beers. 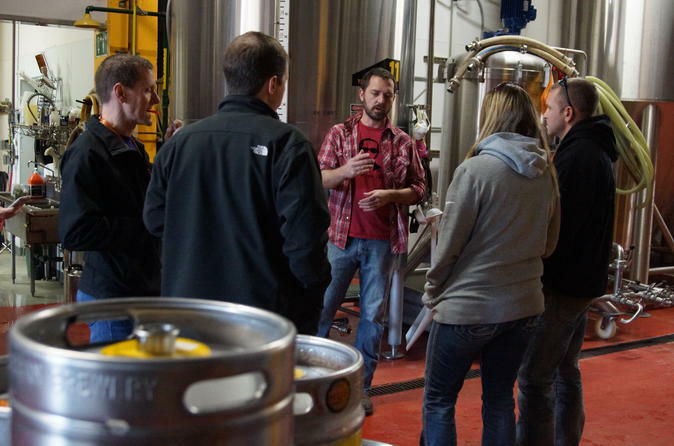 Our Behind the Scenes tour offers a deeper look into the care and passion behind PDX brewing. Starting with Breakside Brewery, recently named Best Brewery in Oregon by Thrillist, we will receive a quick primer on the ingredients involved in the brewing process, all while sampling some of Breakside’s delicious staple beers. Next, we’ll head to Unicorn Brewing, a favorite among enthusiastic home brewers and industry professionals alike. Here we’ll get to taste what a creative team can do with a compact operation. From there we’ll make the hop to Migration Brewing to see what this local favorite is all about. Enjoy a round of appetizers and sample beer that is truly a neighborhood staple. Last but not least, we’ll wrap up the afternoon with a visit to the brand new Cider Riot! tasting room & public house to enjoy your final Portland craft beverage behind the scenes.